I was surprised how nice these chairs were. They fit in well where I put them. They are well made and solid wood. If you like the style, they are a good buy. Antique inspired elements and contemporary livability come together to create a classic style that will look beautiful in any dining space with the Eleanor Napoleon Chair from iNSPIRE Q® Classic. Authentic details like visible wood grain and an elegant Napoleon styled back add a sense of traditional charm to the design. 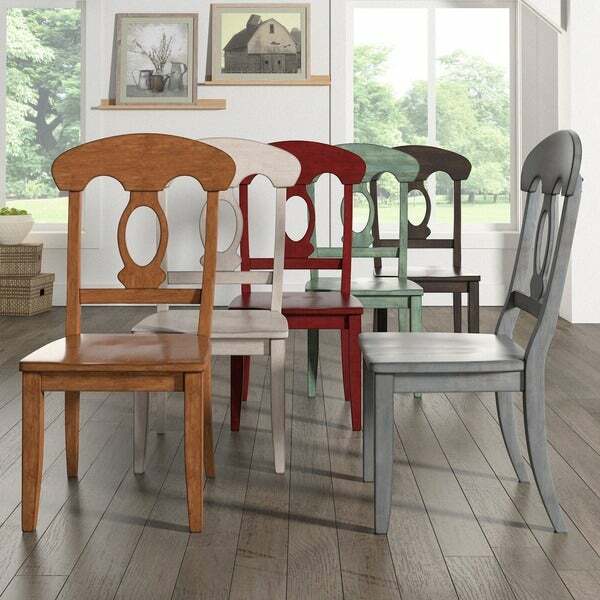 Whether you're hosting a holiday party or a simple gathering of friends, these casual yet sophisticated dining chairs are perfect for all occasions. Available in several distressed finishes, including neutrals and bright hues, so you can add a splash of color to your home and express your unique design taste. I received these chairs today in the mail very easy to put together high-quality love the color . 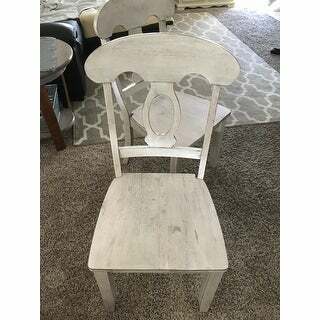 I chose the antique white it is beautiful it almost looks like a distressed finish and that’s what I was looking for it’s a perfect addition to our home . I am pairing it with the Magnolia table in antique white . 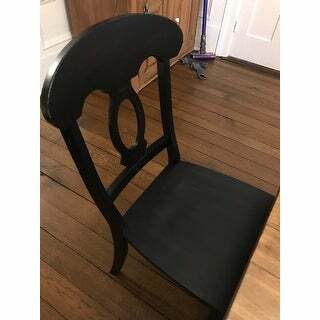 Ordered the antique black chairs a couple days ago. They arrived earlire than expected, and I assembled them today. Very sturdy- wonderful quality. 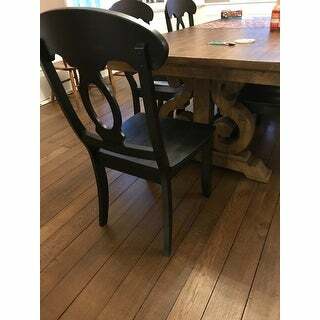 The finish is not a shiny gloss, and the antique look means the wood shows through the black in places, but they don’t look like old beat up chairs. Assembly wasn’t difficult- in addition to provided hardware you just need a Phillips head screwdriver. Assembled them myself with no problem, except for a missing bolt and one front leg which had pre drilled holes, but no metal inserts in them like the other legs had. I called customer service and they were easily able to put in a request for replacement parts which they said should be sent to me in about two days. Then I will be able to finish the last of the six chairs. Very happy with the chairs and with the customer service! These are wonderfully well-built chairs!!! My father-in-law put them together (as well as a pair of the Eleanor French Ladderback chairs in red) with ease in only a few hours. They are solid wood, extremely sturdy and generously sized in the seat. The satin finish is lovely. . .smooth and a perfect mingling of rustic elegance. I will say that it is just a tad darker than pictured, but that is exactly what I was hoping for anyway. ;) You simply cannot ask for better craftsmanship than what you will find in these chairs. I just cannot believe how reasonably priced they are! Everyone who sees them in my dining area just raves about how much they love them. . .and so do I. My sister is ordering a set in oak for herself, too. I HIGHLY recommend them. 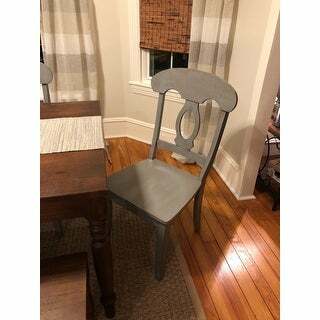 I purchased 2 sets of 2 of the Napoleon back chairs in antique grey to coordinate with the Eleanor two tone dining table in antique grey. These chair are very sturdy and stable. The coloring is beautiful. They work perfectly in our space both in size and color. Putting them together was easy, but I wish the directions had stated to pay attention to which way the predrilled holes were facing when attaching the base. Easy fix, but it was unnecessary to have to take it apart and reattach correctly. Overall, I felt this was a good purchase. 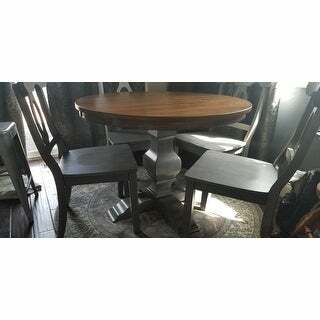 I plan to buy 2 more, for a total of 6 so when we use the leaf in the table we will have a set of matching chairs. I love my new chairs. I’ve had them for almost a year now. They are exactly what I was looking for. Beautiful and sturdy. Assembly was quick and easy too. I purchased six of these chairs in navy blue and found them to be well made and sturdy. Very happy with my purchase and highly recommend. Very nice and sturdy. 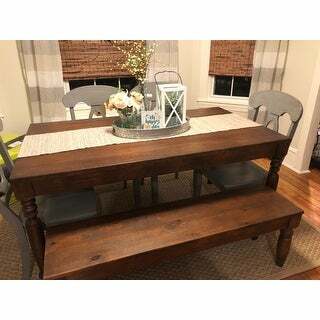 Easy to put together and goes great with the table and other chairs. 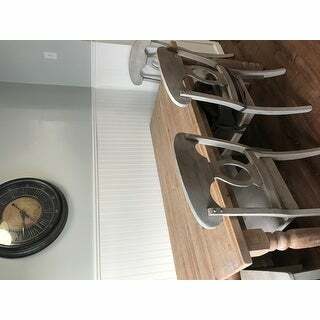 I purchased different back styles and colors to go for a farmhouse look. Love these chairs! 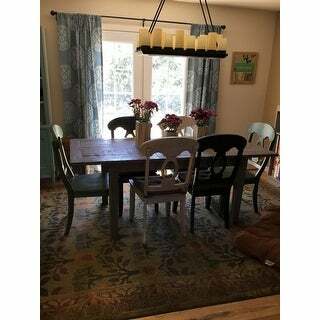 Bought two blue, two white and two green to go around a gray farmhouse-style table and they look great. Love the sage green chairs, they match the table perfectly! Warning: the sage green is darker than it looks on your computer and a little bluer! 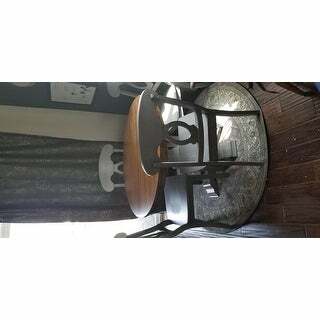 The seats are large and six chairs does't fit tightly around the oval Eleanor Table. I do like the chair seats and pretty designed backs. Are solid and came undamaged in a timely manner. I would recommend these chairs! I have always liked the Napoleon Back Chairs but they were always a bit pricey. I just looked at them on Pottery Barn but they had rush seats. Leave it to Overstock to have what I want/need and the price was right. All the colors were great, I chose the red, I will say the color leans a bit more to the Burgundy. I am very pleased with these chairs, my husband had no trouble putting them together. 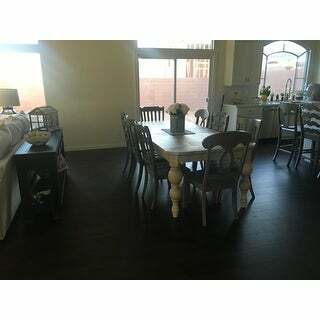 I have a black table and the chairs are very complimentary the backs are very pretty. The chairs are very sturdy and well built, we did buy slides to put under the legs, I would suggest that. Yes, I would recommend these chairs and again I say the price was right. Thought these chairs were lighter than they were. But with the plates and cups I bought they look absolutely beautiful. They definitely look way more expensive than the price. Love them. Yes would recommend them. Love these chairs, easy to assemble and look great! Arrived without damage and very sturdy. Will be ordering more! Great price point as well. These chairs are a great buy! I bought two sets in antique white. Assembly was easy, I was able to pit them together myself in about an hour tops. 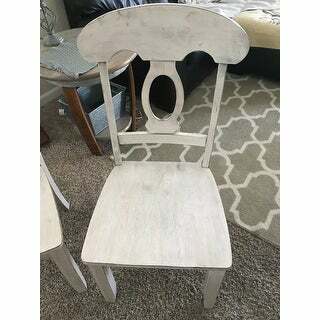 The chairs are solid and and look like they cost much more than they did! I am very pleased with this purchase. We find these chairs to be well constructed, comfortable and nice and sturdy. Easy to assemble. I would definitely buy again, and probabably will in the near future. Match an antique pine table perfectly! "Are these chairs really 20.9” wide at the seat? That just seems so wide compared to other chairs." The seat measures to be 20.9 inches wide x 15.9 inches deep x 17.1 inches high. "what is the weight rating please?" Hello, the recommended weight is 250 lbs. "When will these chairs be available in sage green?" The green is expected to be back in stock in September. "How does the berry red look? Is it a deep red"
Yes, I would describe the berry red color as a deeper red. "I read ur response of 1chair 18lbs n 2 chairs 25lbs?" Each chair weighs approximately 18 pounds. "Is the white a true white or more of a cream color?" I would describe the antique white color as an off-white shade with a grey wash over it. "Is the white a true white or more of an off-white/cream color?"